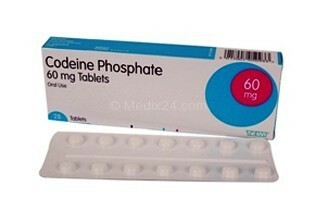 Codeine (Codeine Phosphate) belongs to the group of medicines called opioid analgesics. Codeine is used to relieve mild forms of pain and helps ease a dry cough. You may recognise Codeine as an ingredient of some types of paracetamol, please note that Codeine is then used as an additive unlike Codeine as a stand alone drug. This type of Codeine is not available over the counter, a Medix24 affiliated physician can issue a prescription based on the online questionnaire in our ordering process. Used for treating: muscle and joint pain, back pain, stomach ache. Tablets: swallow whole with a drink of water. Codeine works by binding the opioid receptors in your brain, which reduces the pain that you feel. At the same time it suppresses the reflex to cough thereby decreasing the frequency you cough. Especially when coughing interferes with your ability to sleep or work, Codeine can be helpful. Codeine tablets can be taken with a glass of water. To experience faster results, use Codeine on an empty stomach, but you can also take Codeine with food or milk to prevent an upset stomach. Allow at least four hours between each dose. Does the use of Codeine have contraindications? Codeine can slow down your breathing, it is therefore important that Codeine is not used by people with breathing problems. Never exceed the prescribed dosage as an overdose of Codeine may stop breathing altogether. You may not use Codeine if you have asthma, COPD or hyperventilation. People who suffer from a bowel obstruction disease called paralytic ileus may also not use Codeine. Please note: You may not use Codeine in combination with alcohol. Does Codeine have any side effects? Warning: If you experience swelling in the airways or face, a change in your heart rhythm or difficulty breathing while taking Codeine, please notify your physician immediately. How can I buy Codeine online? 1. You choose your desired dosage. 2. In the next screen, fill in your contact details, answer the medical questions and select your payment method. 2. The answers to your medical questions are reviewed by a fully certified physician connected to Medix24. When your doctor approves your request, he will forward your order to one of the pharmacies who work with Medix24. 4. The pharmacy will ship your order in a discreet package to your home address using Next Day Delivery. This description is based on prescribing information approved by the Medicines and Healthcare Products Regulatory Agency (MHRA), but in no case replaces the advice of a doctor or pharmacist. For a full overview of the usage, contraindications and side effects of Codeine, please download the patient information leaflet.